SINN FÉIN TD Dessie Ellis has detailed the death threats he said he received after he was linked to the murder of prison officer Brian Stack. He and fellow Sinn Féin TD Martin Ferris were named in connection with Brian Stack’s murder by Fine Gael TD Alan Farrell in the Dáil on 7 December. They have since formally filed a complaint relating to the incident. Ferris was said to have received abuse on the matter in his Kerry constituency while a Sinn Féin spokesperson said Limerick TD Maurice Quinlivan received a call to his office last Friday which said that he should “watch his back” because “he’s going to be shot”. Speaking to TheJournal.ie, Ellis said that he had received two letters, one of which was particularly vitriolic, in the wake of the statements made in the Dáil. Ellis, however, said he was taking the threats in his stride. The Dublin North West TD added that he had sent the letters to the gardaí at Pearse Street Station, so they could investigate the matter. A Sinn Féin spokesperson told TheJournal.ie that another TD had received a threat following the naming of Ellis and Ferris in the Dáil. The office of Maurice Quinlivan received a call to the office last Friday evening, where the caller said that Maurice needed to watch his back because he’s going to be shot. The spokesperson said that Ferris received verbal abuse while out in his Kerry constituency. 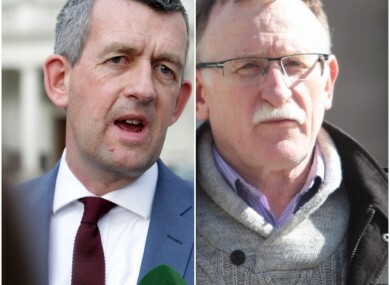 Farrell used Dáil privilege earlier this month to name Ellis and Ferris in connection with the murder of Stack, who was shot dead in 1983. In heated scenes in the Dáil following a statement by Gerry Adams TD, Farrell said that he wanted to raise a “point of order”. Ceann Comhairle Seán Ó Fearghaíl said that there was to be no “point of order at this stage” but allowed Farrell make a comment “very briefly”. At the time, Ellis said to Farrell: “I’m not going to have people put my name out there on something that I have nothing to do with. I refute any allegations. For the information, the man in question claims to be a solicitor, I was actually in jail for the period. In Portlaoise and before that in America so you should check your facts. You’re a disgrace. On the record of this house. In 2013 I met with gardaí at their request regarding the death of Brian Stack, I co-operated fully with them and I have nothing to answer for, and it’s a disgrace what you have come in here naming. You should be ashamed of yourself. Both Ellis and Ferris have made a complaint to the Dáil’s Committee on Procedure and Privileges, accusing Farrell of abusing privilege. Their complaint includes details surrounding the threats and abuse both men have received. According to the Irish Times, a decision on their complaint is due in the new year. Gerry Adams has faced repeated calls in the Dáil, and from Brian Stack’s son Austin, to clarify what he knows in relation to the murder of Stack. In the Dáil yesterday, Taoiseach Enda Kenny rolled back on earlier comments he made suggesting that Adams had driven a blacked-out van when a former IRA commander met the sons of Brian Stack in 2013. Kenny said: “I understand that from the statements made by Gerry Adams that he drove the Stack brothers in his own car to a point where they then travelled in a blacked-out van in which I assume he was the passenger. So I wish the record of the Dáil to the effect that Deputy Adams did not drive the blacked-out van, that he did travel in it. Email “'You're going to be shot': Sinn Féin TDs detail death threats received over Brian Stack Dáil row”. Feedback on “'You're going to be shot': Sinn Féin TDs detail death threats received over Brian Stack Dáil row”.